I love photos like these that are a snapshot of a place at a moment in time. Even better, now that we have Google Maps and street view, we can see what they look like today and now much (or little) has changed. In this case, much has changed as the building seems to be completely gone, but still the property is used in the same way (almost) as a Vitamin Shoppe.– via Google. What’s also very interesting here is how the merchandise is displayed and advertised, as opposed to drug stores/pharmacies today where you see more insurance and vaccination information in the windows than product. Washington, D.C., circa 1922. 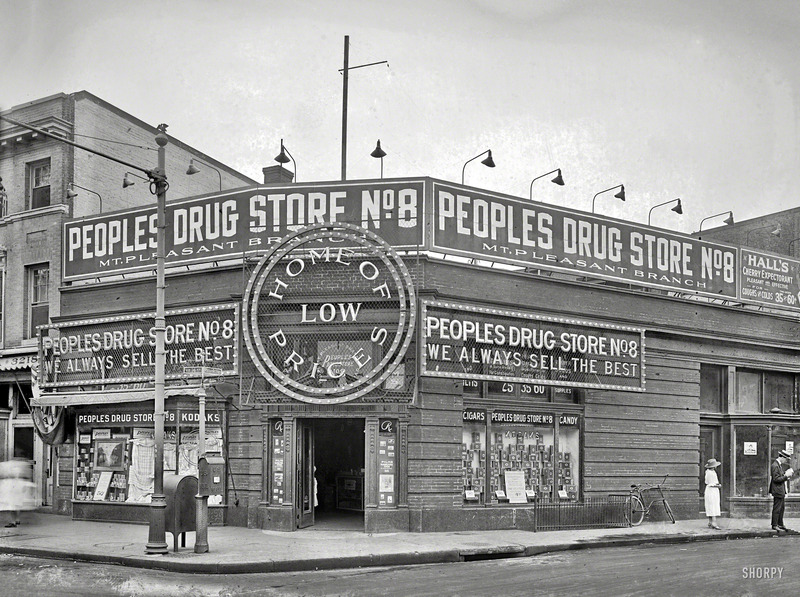 “People’s Drug Store No. 8, 14th Street & Park Road.” National Photo Company Collection glass negative.